Fairy Tale Channel (fairytalechannel.com): Plumed Pogrom or Fairy Tale Ethos? Wow, this is an interesting story. The symbolic goodness of swans must run deep in the subconscious of your town! I have always found the German swan stories to be haunting and intriguing. 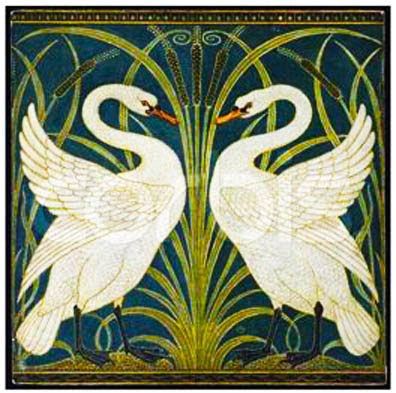 Do you know anything about the connection between swans and muteness in these tales? It seems there is a link among virtue, swans, and the inability to speak. What's that about? I'm curious. That's a great question and one worth exploring further. I wrote a little bit on that topic when I posted the Fairy Sister's July Wedding-tale. If you hit the link at right with the same title, you can read about Taboo and Speech Prohibitions in fairy tales. Also you might have some of your own ideas to add. Ah, those links are very interesting. I see how there is a strong link in German lore between speech and magic or power. But I see a couple different things going on. In the fairy wedding stories and the Swan Knight, someone is punished for speaking a word or phrase about someone else that was specifically forbidden. But in other stories, the ones about abused young girls (The Six Swans, Allerleirauh, The Goose Girl, etc. ), the girl is victimized until the point at which she is able or willing to reveal the secret of the abuse or injustice done to her. Then, after telling the secret aloud, she is saved. I'm still not clear on all this, but it seems like getting in other people's business (asking a forbidden question, naming them inappropriately) causes disaster, while revealing one's own business (particularly abuse by a parental figure) is rewarded. Is this a pattern you see too? Can you think of any exceptions? Yes I think you have identified a fundamental difference between the different speech taboos in fairy tales. I'm going to have to look at these stories again more closely to try to answer your question because I do believe there is a pattern, but I can't say off the top of my head what it is! Maybe I'll look at Allerleirauh next.